Noodles Nail Polish "Enchanted Love" is a saturated raspberry jelly base filled with holo flakies, silver holo and rainbow iridescent glitters, purple metallic flakies, and purple/gold shimmer. The shimmer isn't very visible to my eye but the flakies give it so much depth! This had great formula and applied easily. Shown is two coats plus top coat. Contrary Polish "We Sleep, We Dream" is a dark royal blue base filled with sparkly reddish brown/gold/green/blue shifting multi chrome shimmer, and holo microflakes. The shimmer is much more visible in person and is just gorgeous! Shown is two coats plus top coat. 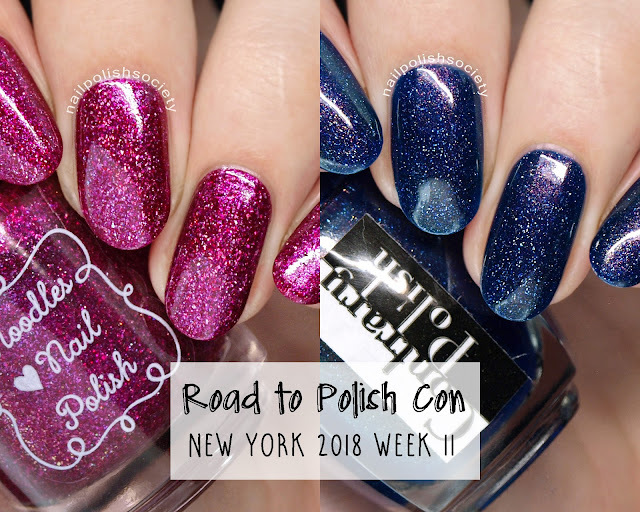 The Week 11 polishes will be available for one week only- Sunday May 27th through Saturday June 2nd. Shipping is a flat rate of $3.50 for Domestic orders and $11.00 for International orders.